The rigger is mounted closer to the longitudinal center of the boat providing better balance, eliminating pin torque, and allowing for an unmatched range of heights. One wrench is all you need and the boat can be rigged in under a minute. Fluidesign hulls are uncommonly durable as no core is incorporated in the hull. This structure minimizes impact damage to the skin. Fluidesign engineering incorporates industry leading longitudinal stiffness and a decreased drag that will get you across the finish line faster. Carbon/innegra exterior. 80% carbon construction. Our most durable model. A light and performance oriented boat. 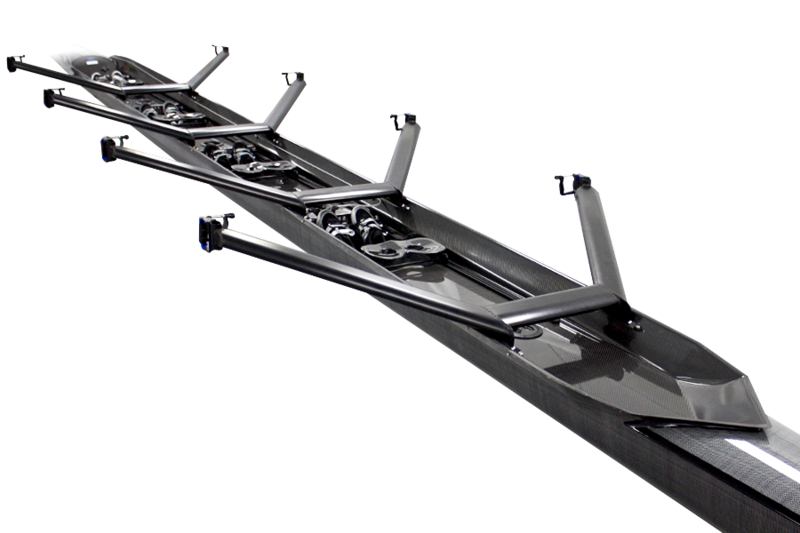 New modular aluminum bow mounted rigger anodized black. Carbon Seat with anodized aluminum rails. Oarlock height and span, foot stop, rigger, rails, shoes. Carbon footstop upgrade, Premium shoe upgrade, color choice for edges on decks. Prices in USD. Subject to change.